The beautiful canal house at 40 Oudezijds Voorburgwal has a secret: a hidden church in the attic! You might have passed this house and thought nothing of it, however Our Lord in the Attic is one of the last remaining hidden churches in Amsterdam. The house itself is about 400 years old, however exploring it is part of the charm as you know that there’s a church inside, but you need to keep climbing the stairs until you find its secret. Although the Netherlands proclaimed that there was religious freedom in the Dutch Golden Age, this was not necessarily the case for Catholics who were stifled underneath the rule of a Protestant government. At this time, many Catholic churches were converted into Protestant churches or left abandoned. Mass was not allowed, however technically, people could celebrate their faith however they like in private. A prominent merchant of Catholic faith owned this beautiful canal house as well as other nearby houses. He specifically purchased the nearby houses (2 of them to be precise) in order to make space for a church in the attic (next to his storeroom). What I love about this museum is that it’s furnished with original and period pieces, so you get a great idea of what life was back in this time. (The beds puzzled me for a while.) As you walk around the house, you can easily imagine yourself at this time and I feel the drama of exploring the house on your own without a tour really adds to the experience. You’ll enter the house through a tunnel underneath the basement prior to finding a door that leads up to the attic where around 150 Catholics could pray. The house even includes a house for a priest who appears to live in a separate house. (His quarters are included in the tour.) I come away with each visiting appreciating the freedoms that we have today in the Netherlands and many other countries. The museum itself usually takes 1-2 hours to go through depending on how long you like to linger. As soon as you enter, you’ll be given a headset (available in most major languages) that you can hold to your ear as you go through the museum. It narrates the history as well as helps you appreciate the details of this finely decorated house from the Golden Ages. It’s rarely crowded here, but I always like coming on a weekday. 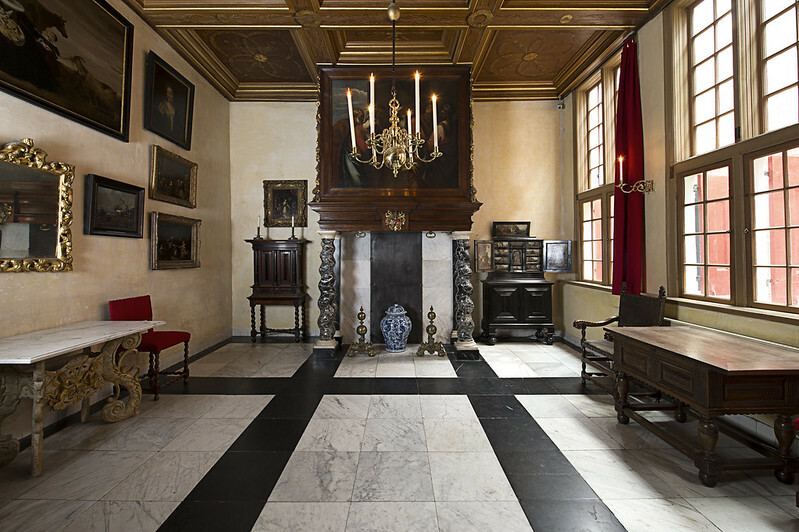 It’s popular with Dutch residents on Wednesdays and weekends (the museum is open most days; check hours). Something that I would recommend knowing is to avoid wearing open toe shoes. As you will be walking on the original floors, you’re required to put on shoe covers, so I’d recommend wearing closed toe shoes to make it easier to wear these shoe covers. My favorite room in the canal house is always the cooking kitchen. Many pass through as it’s not as lavish as other rooms, however the story of how they have original plates from the period (on the screen) is hilarious and worth stopping for. Be sure to tap the screen in the room with the beautiful plates…. If you’re just visiting, this hidden church is included in the iAmsterdam card. The iAmsterdam card can be purchased for different intervals depending on your stay. It includes a canal cruise, public transit, and many museums in Amsterdam, including the Van Gogh museum and the Rijksmuseum. I find that it’s a great solution for those looking to maximize their trip to Amsterdam with minimal planning. If you’re Catholic (or on a budget), you can attend Mass at the church on Sunday mornings on the first Sunday of each month for free. Services begin at 11 am and last an hour. You must arrive around 10:30 am if you wish to attend. Have you been to this hidden church in Amsterdam? What is the best way to get here and avoid the red light district? Traveling this summer with family that doesn’t want to go in that area. Hi Kami, if you walk via Nieuwebrugsteeg, you won’t see the heart of the Red Light District.